Find the words mentioned in the easter word search and cross them out. The letters will explain an important character around easter. Easter celebrates the resurrection of Jesus Christ on the third day after being crucified , as related in the New Testament of the Bible. It is the most important celebration of the Christian Church. Easter is also known as Easter Day, Easter Sunday, Easter Sunday, Glory Sunday or Holy Sunday. Easter concludes Holy Week, days commemorating the crucifixion and death of Jesus on Good Friday and his resurrection and apparition to his disciples on Easter Sunday. With Easter begins a period known as Paschal Time, which lasts fifty days, and ends on Pentecost Sunday. According to the Sacred Scriptures, with the Passover God gives Christians hope for the resurrection and for a new way of life , represented in the return of Christ from the dead. Easter is a mobile holiday, whose day varies every year. This is because the date is not set according to the civil calendar, but for the liturgical year, which is governed by the lunar cycles. Thus, Easter is always located after the first full moon after the beginning of spring in the northern hemisphere, and autumn, in the south. 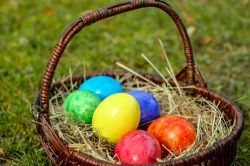 In this sense, Easter can be celebrated between March 22 and April 25 .And the day it falls is important to also calculate the dates of other religious holidays, such as Pentecost and Ascension. The term Easter comes from the Latin páscae , which in turn comes from the Greek πάσχα (pasjua), an adaptation of the Hebrew פסח (pésaj), meaning “paso” or “salto”. The origin of the celebration of Easter is found in the Old Testament of the Bible, in the book of Exodus. There is narrated the march of the people of Israel from the captivity in Egypt to the promised land, and explains how the Easter celebration should be carried out for the Hebrew people. The Christians, however, separated the celebration of the Jewish and Christian Passover at the First Council of Nicaea (325 AD), and defined the elements of the Christian celebration, which celebrates the resurrection of Jesus Christ. 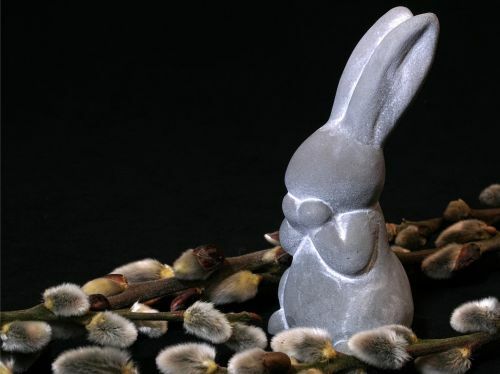 The Easter rabbit is a symbol of fertility, since at the end of winter and the beginning of spring, in the northern hemisphere, it was when the animals began to appear with their young, remembering the rebirth of the earth. The Easter egg represents the beginning of life. For this reason, in several countries chocolate eggs are given to friends and family to wish them a good Easter. It is a large candle decorated with a cross in the center that is used during the Easter Vigil. His light symbolizes the resurrection of Christ. The flowers represent life and joy for the resurrection of Jesus and the new life he brings us. The temples are usually adorned with many flowers this day. The lights have a special role in the Easter celebrations: they are the ones that evoke the idea that Easter is the return of light for all in the resurrection of Christ. Therefore, it is used not only candles but bright colors, cheerful and festive. Passover, also known as Passover, is the Jewish holiday that commemorates the departure of the Hebrew people from Egypt, recounted in the biblical book of Exodus. The Hebrew people consider that this fact marks the birth of the town as such. The celebration coincided in the Hebrew month ( Nissan ) that corresponds to the last days of the months of March and April, when the spring season began. The Jews continue with the tradition contemplated in the book Exodus.During the festival, which takes place over seven days, a special dinner is served with unleavened bread, wine, herbs and lamb, where the whole family gathers. During these holidays the intake of fermented cereals is prohibited. The egg is a symbol of Easter that represents the beginning of life and fertility . For Christians, it symbolizes the Resurrection of Jesus Christ and the hope of a new life. The tradition of giving eggs on Easter Sunday is very old and common in the countries of central Europe, England and the United States. It arose as a consequence of the abstinence that the Catholic Church commanded to keep during Lent. In this period, Christians could not eat meat, eggs or dairy. Therefore, when Lent ended, the faithful gathered before the churches and gave eggs decorated with colors and festive reasons, since Jesus Christ had been reborn and had to lift the abstinence and celebrate. Let us remember, moreover, that Easter also brings spring back, the greening of the fields occurs and the animals begin to reproduce. It is not by chance, then, that the egg, symbol of the new life, is associated with the hope of soil fertility and harvests. Nowadays it has become customary to give chocolate eggs. Some hide them so that the children look for them. Sometimes, it can be accompanied by other surprises, like a stuffed animal. 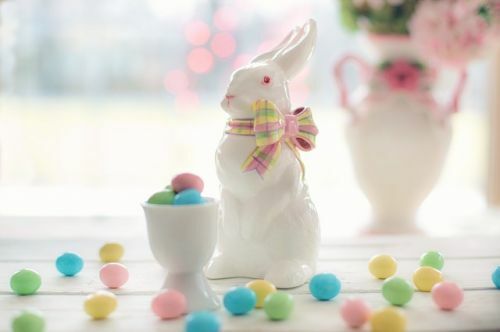 The tradition is to give Easter eggs, has added a character called Easter rabbit, which is responsible for bringing the eggs, just as Santa brings gifts at Christmas. These eggs are sometimes hidden throughout the house for children to find, as a game. Both the eggs and the rabbit are considered symbols of life and fertility.The egg, for example, represents the beginning of life, while the rabbit is an animal appreciated for its great reproductive capacity. Christianity has been adopting the symbol of the Easter egg as part of its celebrations for the Easter holiday. Some people even decorate the eggs with images of Jesus and Mary, in order to represent life and rebirth. However, it should be noted that in the Bible there is no reference or mention of Easter eggs or the custom of giving Easter eggs . Most likely, it is a pagan custom amalgamated after the celebration of Christian Easter. The Easter rabbit is one of the symbols of the Easter festival ; represents fertility, birth and life expectancy. Before Christ, the Germanic peoples considered the rabbit a symbol of fertility, and associated their appearance at the beginning of spring , with the rebirth and renewal of nature after the winter season. The rabbit was, then, the first animal to leave the burrows and to procreate, due to its great reproductive capacity. According to ancient legends, the rabbit appeared at Easter with a basket full of sweets and colorful eggs, which he hid to be found. Hence the tradition of hiding Easter eggs for children to find them. The rabbit is used today as a symbol of Easter , which is the Christian festival to celebrate the hope of life after the Resurrection of Jesus Christ in Holy Week. However, neither the Easter bunny nor the Easter eggs it brings are mentioned anywhere in the Bible. The tradition of the Easter rabbit is associated with fertility celebration rituals that were held in northern Europe in pre-Christian times. In addition, the legend according to which in the tomb where Jesus was there was a rabbit that witnessed his resurrection is also false, without any support in the Holy Scriptures. During Holy Week the most important religious acts for Christians are commemorated since it is a time to reaffirm the faith and remember which are the bases on which Christianity was based. Therefore, in different religious acts they are accustomed to using different symbols referring to the life, passion, death and resurrection of Jesus Christ. The palms and branches are symbols of victory. When Jesus arrived in Jerusalem, riding on a donkey, he was greeted by a crowd of people who sang songs and had palms or branches with them in order to greet and congratulate the messiah. 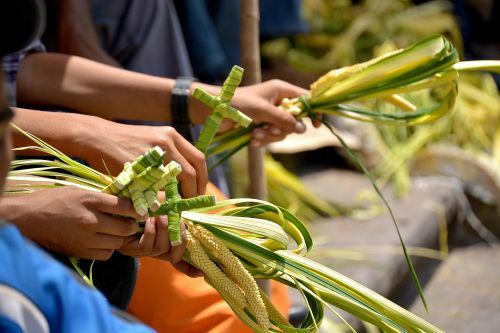 Hence, on Palm Sunday, parishioners seek and bless a palm leaf or bouquet at the mass, which they traditionally place in the houses as a religious protection. The bread and wine symbolize the eternal life, the body and blood of Jesus Christ that was offered to his disciples at the Last Supper. They also symbolize the union of the faithful with their Christian faith. The bread represents the body of Jesus Christ given to his people, who eat it will have eternal life. The wine symbolizes the blood that Jesus Christ shed for his people, to those who drink of his blood his sins will be forgiven. 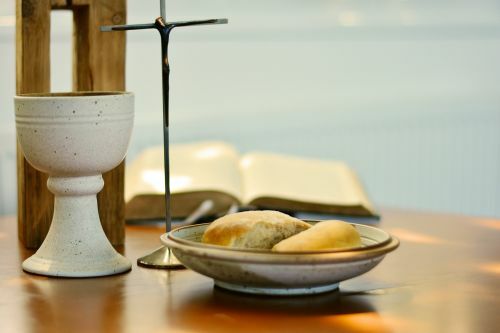 On Holy Thursday there is the Evening Mass of the Lord’s Supper, in whose Eucharist the symbolism of bread and wine is mentioned as the body and blood that Jesus Christ offered to humanity. 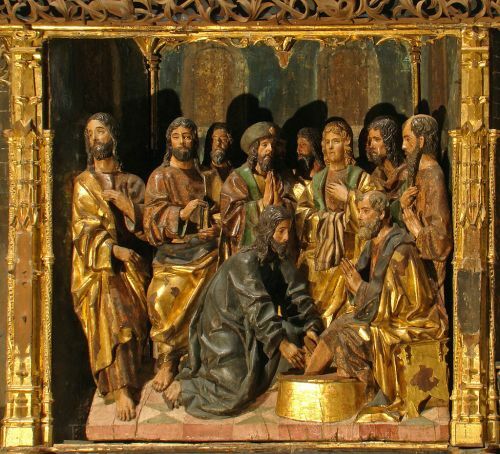 The washing of feet is a symbol of humility and dedication of Jesus Christ to others, during the Last Supper he washed the feet of his disciples as an example of what they should put into practice throughout their lives, that is, love, humility and serve others. This act is repeated in the Eucharist of Holy Thursday by the Pope, the bishops, and parish priests in each of the communities in which they teach the Mass. 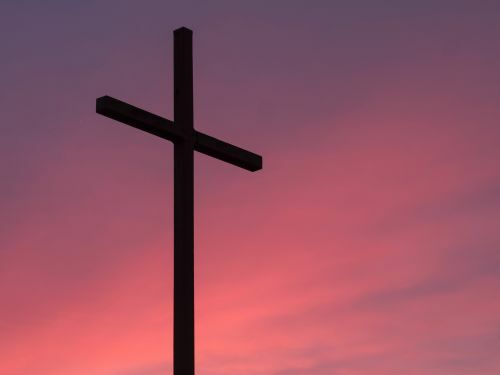 For Christians, the cross has a very valuable meaning, since it symbolizes both the suffering, passion and sacrifice of Jesus Christ for humanity as well as salvation, reconciliation and union with Jesus Christ. The cross is the main symbol of the faith and the Catholic Church. On Good Friday the Cross is presented to remember and thank the sacrifice that Jesus Christ made to cleanse the sins of the world. The Paschal Candle represents the death and resurrection of Jesus Christ, the light and life of the world. 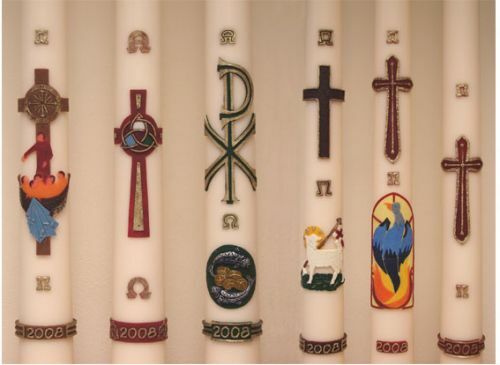 The Paschal Candle is a large candle, white in color with the Greek letters Alpha and Omega engraved, which signify that God is the beginning and end of everything. The fire that is used to light the Paschal Candle derives from the candles lit during the Easter Vigil. The fire of the Paschal Candle is new that renews the faith, of this fire, in addition, the rest of the candles are lit. This fire represents the resurrected Jesus Christ and winner of shadows and darkness. During the night of Easter the baptisms are carried out in order to incorporate Jesus Christ into the life of the baptized. Water symbolizes life and is a means of purification. 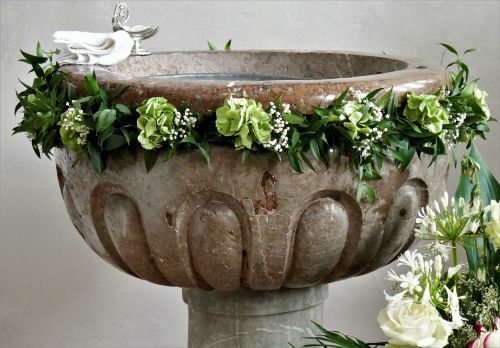 The baptismal water is used to renew Christian values. Easter or Resurrection Day commemorates the resurrection of Jesus Christ.The rabbit is an animal that symbolizes life and fertility. That is, the life of the resurrected Jesus Christ and the ability of Easter itself to incorporate new disciples into Christianity. See also Easter Bunny . The Easter Egg, like the rabbit, symbolizes life and fertility, the beginning of a new life. At Easter the Egg represents the resurrection of Jesus Christ. 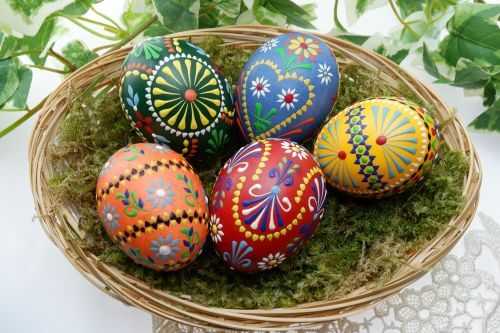 The custom of giving eggs on Easter Day is very old, so it spread throughout the world, so much so that there are countries in which you have the habit of painting eggs. Nowadays, many people are accustomed to give chocolate eggs in Easter that contain a surprise inside. Easter Word Search for Kids | ABCya! Easter Word Search is a fun holiday activity for children of all ages. Puzzles can be created two ways: a small grid with shorter words or a larger grid with longer words. Easter - Word Searches. These Easter word search puzzles feature hidden Easter words to find and a picture to color. The word search puzzles are printable and the puzzle changes each time you visit. Word searches are great activities to help your kids develop their problem solving and analytical skills. Advise of travel outside Australia – Centrelink online account tutorial.